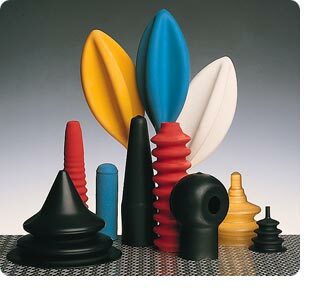 Chloroprene or natural rubber and other synthetic latices such as Nitrile are particularly suitable for the production of very complex shapes in small and medium quantities, although larger volumes can be produced. 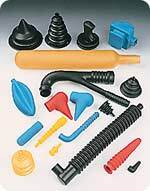 However the techniques and materials are more expensive than PVC dip moulding and consequently, the processes should only be considered when the particular properties of Chloroprene or Natural Rubber are required. Chloroprene dip mouldings, tested against BS 903, show the following properties. Normal BS softness is 100 and wall thicknesses can be between 0.1mm and 2mm. Low cost Latex Dip Moulding is the answer for producing complex shapes which are expensive if made by any other process. The elastic characteristic of Chloroprene is one of the main differences when compared with PVC and this is important where, for instance, a product has to be considerably stretched during fitting. The high elongation at break and low modulus are also beneficial in such an application. The permanent set of Chloroprene is lower than PVC and this is important where, for example, the elasticity of the moulding is required to secure it to another component. Chloroprene has generally higher solvent resistance than PVC, particularly to aliphatic hydrocarbons such as petrol. It can also be used at higher temperatures and in the range -40°C to +100°C shows less variation in properties. Prolonged exposure to high temperatures, however, would result in ageing problems. Most mouldings are matt black, colours are available if required. It is not possible to produce gloss finishes or semi-rigid mouldings. The properties of mouldings made from the two materials are similar, although Chloroprene has better ageing and weathering characteristics with high resistance to ozone cracking, uv irradiation and oxidation.